The Panasonic KX-T7425 is a digital conference speakerphone which is compatible with Panasonic super hybrid KXT systems. This unit has 24 programmable line buttons and a WOHCA intercom key. Altogether a versatile terminus suitable for a scalable PBX exchange. The Dynamic Resource provides quality refurbished Panasonic- KX-T7425 Phones Panasonic at an affordable price. All Panasonic- KX-T7425 Phones Panasonic are refurbished Panasonic that will be delivered to you in like new condition. Call today about quantity discounts available for refurbished Panasonic- KX-T7425 Phones Panasonic. The Dynamic Resource is always striving to provide the best quality used business phone equipment at the most competitive prices. 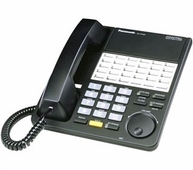 Our Refurbished Panasonic- KX-T7425 Phones Panasonic have been restored to an almost new quality and priced to be the most competitive on the web. If you find a better price on Panasonic- KX-T7425 Phones Panasonic give us a call and we’ll beat it! 1-888-234-4975 (Toll Free).